Two rings both made in 18ct Rose gold. 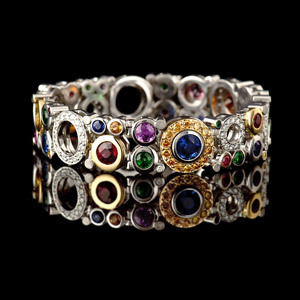 One has a stunning .92 carat orange sapphire with a halo of diamonds surrounding it. 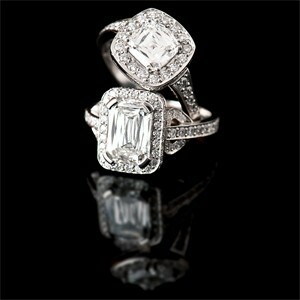 The other ring has a half carat central diamond with diamond halo surround. 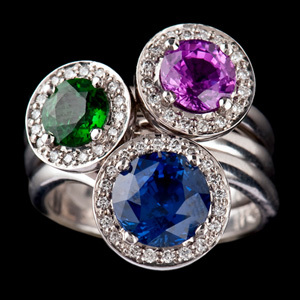 This Photo has three different rings from our Carbonated collection. 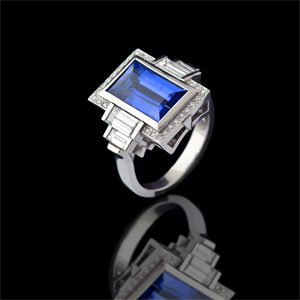 The stunning White diamond and Blue sapphire Platinum crossover ring. 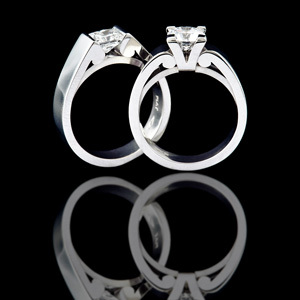 The other two rings are all Diamond one is 18ct Yellow gold the other Platinum. 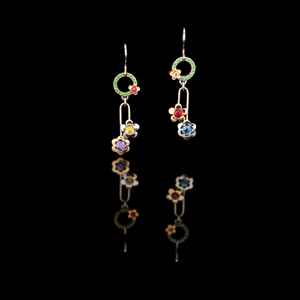 These can be made with your choice of gem stones and metal. 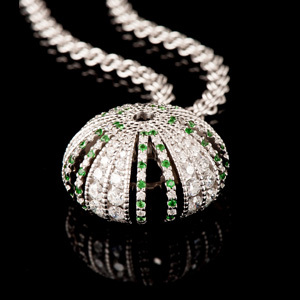 This hand made pendant is part of our ‘Flowers’ collection. Designed to be fun and colourful like a bunch of flowers in your garden. This can be easily customised. 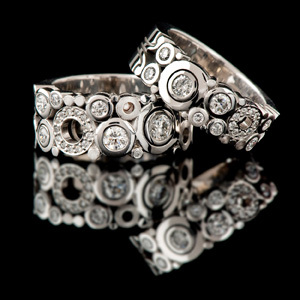 Three stunning platinum wedding bands. Using top quality Baguette diamonds along side rounds. 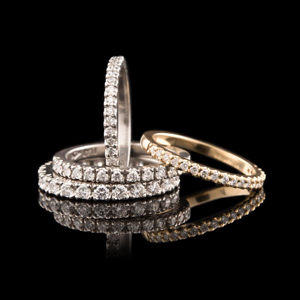 All set in different ways to make three simple and elegant wedding bands. Beautiful 0.75 carat D VS2 Diamond Cushion cluster ring Total wieght 1.32cts. Made in platinum. 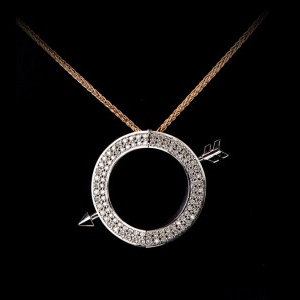 For those ladies that have been asking for a yellow gold version. We have managed to develop this stunner. It is not fully yellow gold which is why is works so well. 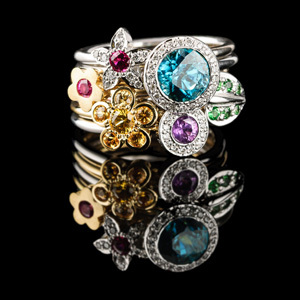 Made in the Carats jewellery workshop this ring can be customised to your own taste. 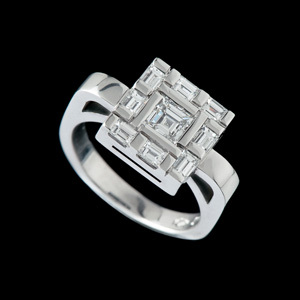 This is the perfect diamond dress ring. Twinkle twinkle little stars, you will definitely sparkle with these little beauties, dress them up or down, these easy to wear Diamond Star earrings are all you need. 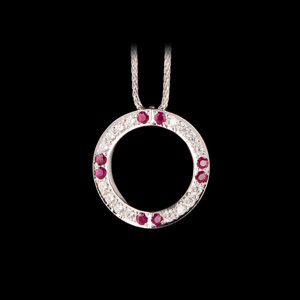 We can make these in white, yellow or rose Gold also with a coloured centre stone of your choice.